Governor Jan Brewer of Arizona was placed in the very difficult position by her own predominately Republican State Legislature of having to Veto Legislation which would have made it Legal to Dis-criminate against Anyone for Religious Reasons. 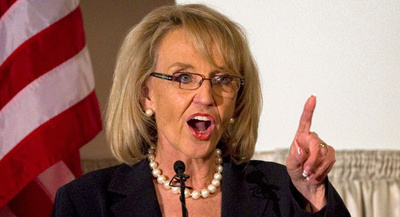 If Governor Jan Brewer had passed the Questionable Legislation, and a Human Being had Walked into a Business owned, UnKnowlingly, by a Religious Person, and that Human Being had been Gay or Gray or Green or Redheaded or Balding or Muslim or Hare Krishna or Fat or Ugly or not wearing designer clothes, or, or, or...etc. Most of the Republican State Legislators wanted their Citizens to be able to say that Human Being, "You offend my Religious Sensibilities and Rights, and I am throwing you out of my business establishment and refusing you Service, because God wants and expects me to be hateful and mean-spirited toward you. Because God is not a Loving and Inclusive God, but an Exclusionary and Hateful God, who although He Created All Things In Heaven and Earth, despises you because you are Different (from me that is). And you are Different because my Societal Grouping, Culture, and Religious Sensibilities say that you are. Even though all of you Different Ones have existed on this Planet right along side all of the rest of God's Created Creatures from the Beginning, and have just as much Right to Exist here in Peace, Love, Dignity and Acceptance as the Rest of Humanity. We Religious Right Persons, and Republicans, have decided that we want to put you in your De-graded and Inferior Place, your Lock-Box, by Excluding you, and Refusing to Do any Business or any other Societal Activity with you. You Dis-gust us. You Re-pel us. And God wants us to tell you so-ee-oh-ee-oh. Even though Scientifically and Societally speaking, Homosexuals are an important part of the Human equation because your existence in the Chain of Life helps to keep Humanity's ever increasing and Overall Population down. Especially, since some Humans can't seem to control their libidos, and seem determined to overpopulate and cannibalize our Planet. So, the Religious Right must continue to make really Destructive so-called Decisions to ostracize and punish Homosexuals, no matter how intelligent, talented, and hardworking they may be. No matter what good Citizens, Neighbors and Friends they are. No matter how many abandoned or orphaned Children they adopt and Lovingly and Law Abidingly Raise to Be Good, Hard Working and Law Abiding Citizens in Societies. No, instead, men (and some women) like the Republicans and Religious Right in Arizona (and elsewhere on our Planet) create Laws to De-grade those who are Different, Poor or in need of Proper and Ethical Medical Care. And Laws which enable more and more Humans to have the ability to overpopulate an already overpopulated Earth, instead of helping them to Stem the Tide, and lead more Productive Lives in other ways. Do the Religious Right and the Republicans Think or Feel that God wants them to over- populate and cannibalize the beautiful blue-green Cosmological gemstone Planet, Earth, we call our Galactic Home ? And why are the Republicans, who claim that they are against Big Government, using the State and National Governments in increasing Strategies, Tactics and Laws to continue these Destructive Patterns ? Did God put you up to all of this short-sighted and cruel chicanery ? Perhaps you should check-out your Connection to and with God. It appears to be rather plagued with corruptive and disruptive static. Jesus did not Teach Dis-crimination against Others. He welcomed the Dis-criminated Against into his Fold. He walked into the Leper Colonies, the Poor areas of Towns, the Streets of Thieves and Prostitutes, the Temples filled with greedy Money-Changers, the cruelly murderous and Dis-criminatory Palaces and Courts....etc. He Touched with UnConditional Love and Acceptance What and Who was considered by the So-called Righteously Religious as UnWorthy - as UnClean - as ImPure. He Compassionately reached out to, and counted as Important and Meaningful the ostracized DeFilers and DeFiled, and urged them to Life - to Live Full Lives amongst the very Righteously Religious Societal DeFilers who Feared them, and so DeFiled, Excluded and Dis-criminated against them. He Taught that we should Work to Live in Peace and Harmony with those who Stand in Dis-Agreement with us. That the Lions should live Peacefully and Harmoniously with the Lambs. That Lions can bleat and that Lambs can roar. He Taught that we are to Love one another as we Love OurSelves. Do the Righteously Religious Love ThemSelves ? Can you Love All Others ? Can you Live as Christ urged us to Live in Agape Love, Tolerant Acceptance and Light ? We are a Nation whose ForeFathers and ForeMOthers deliberately Separated the Powers of Church and State. They knew the superstitious volitility of Living in Societal Environments that Willfully Dis-criminated against their Own for whatever Reasonings and UnReasonings Chosen for this or that Moment of the Day or Time of the Year. Republicans, Tea Partiers, Religious Right, you keep swearing that you Respect and Honor Our Constitutional Ideals. Then, please, try Practicing what you Preach, and what Christ actually Taught. We are to Love and Acceptingly Embrace One Another within Compassionate, Empathetic Grace. God's Love and God's Grace are Constructively and Positively Transformative. Are you ?